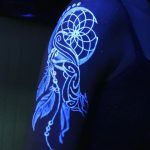 The trend of UV ink tattoos has spread like wildfire among today’s youth. Their specialty is the fact that they are invisible under normal light but shine bright under black light. 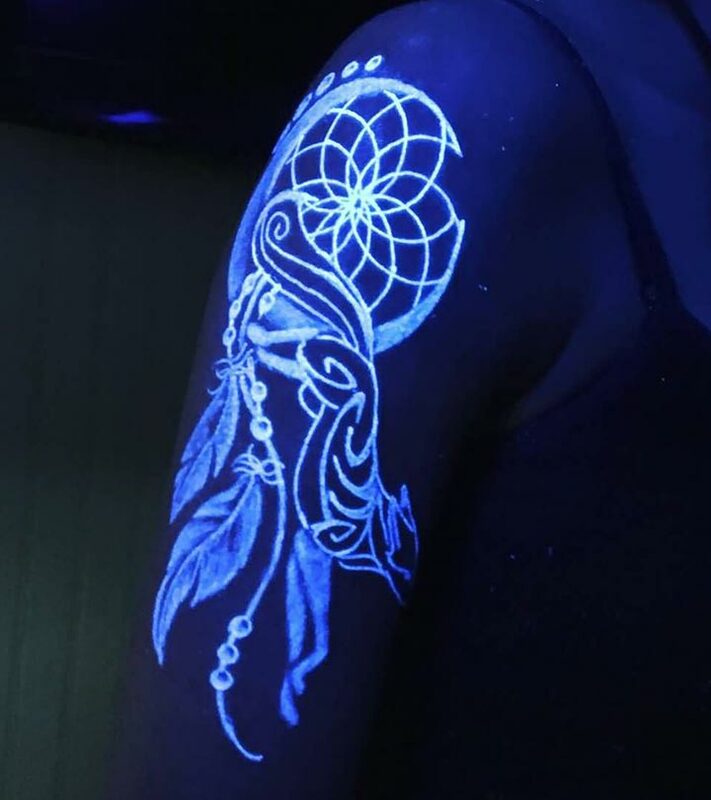 So if you are looking to get cool tattoos made all over your body but are scared that your parents won’t approve, UV tattoo ink are the thing for you! 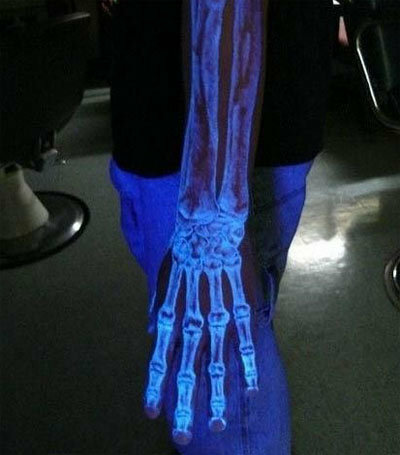 UV tattoos make normal tattoos look way cooler too. There is something about glowing in the dark that gives it that special touch which makes it different and thus more coveted. 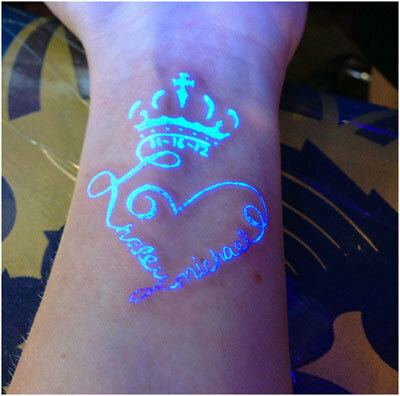 This is the most common and fitting form of UV tattoo. You look normal enough in ordinary white light but once you walk into black light, you would scare the hell out of anyone. 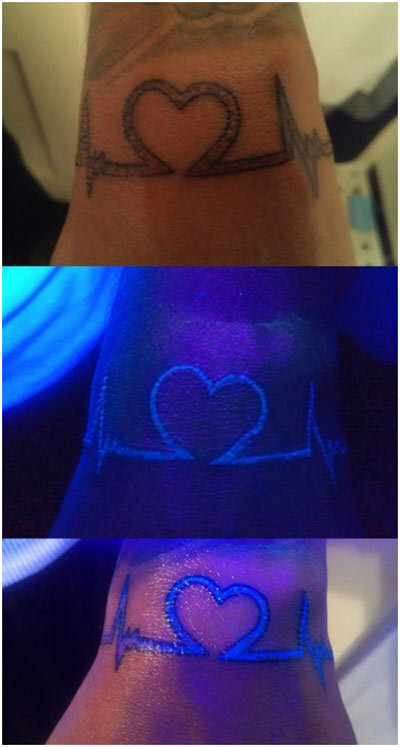 If inked properly, the tattoo actually makes it appear that the black light is allowing one to see through your skin! Many people get names tattooed on their arms or other body parts. Sometimes it’s their own name or the name of their beloved or someone they have lost and loved immensely when they were alive. People often get quotes or other interesting words tattooed on their body parts. One very common type of word UV tattoo is the use of magic words. For example the word ‘lumos’, which is a common spell in the fiction series of harry potter. 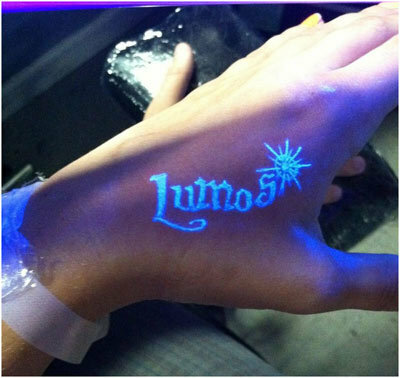 It is used to provide light and thus, seems appropriate for a UV tattoo. 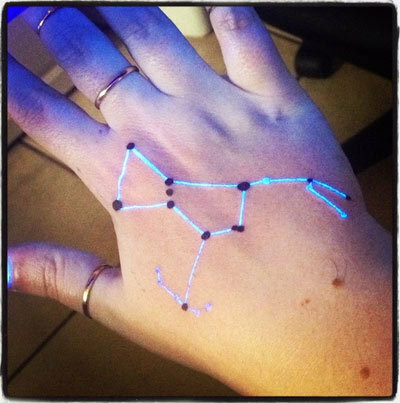 Another common feature in UV tattoos are constellations. Stars are associated with luminescence and are thus an obvious choice for UV tattoo designs. 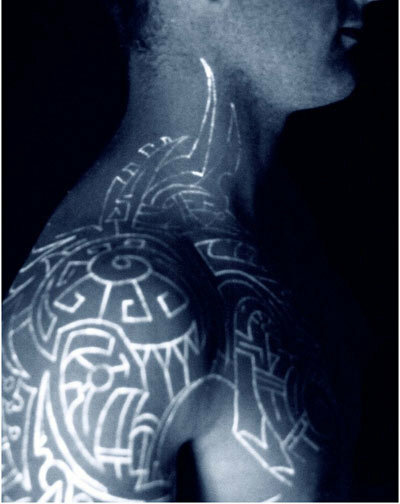 UV ink tattoos should generally feature elements that emit light of their own. Stars are a common example. Another one like this is lightning. 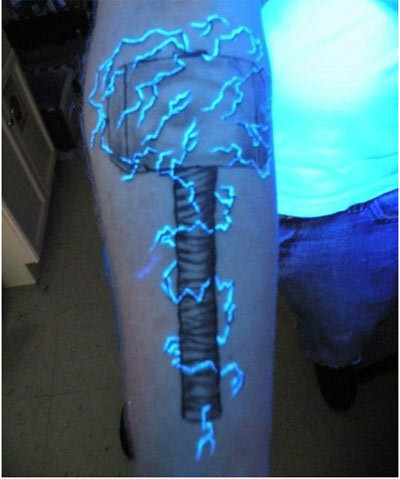 Skilled tattoo makers can ink lightning in really cool tattoo designs that look really cool. Holy things seem more magical and godly if they are glowing in the dark. 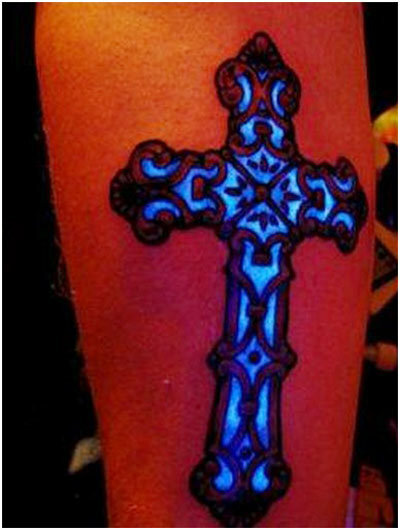 Many religious fanatics get crosses tattooed on their arms with UV ink to make them glow and seem more powerful. If you are looking to get awe inspiring effect, this is the one that you should go for. 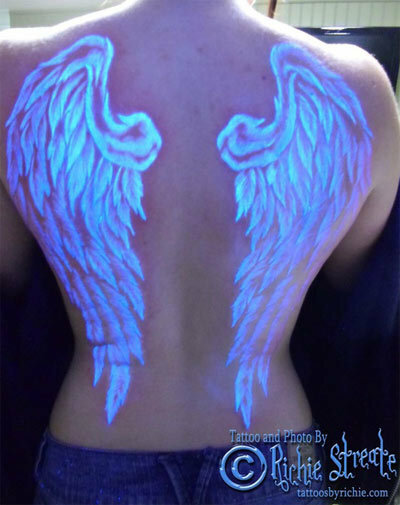 Imagine looking at someone’s back in broad daylight and seeing plain skin and then watching wings sprout on them as they walk under black light! This tattoo will have an astounding effect when you take off your shirt off in clubs and parties. Many fanatics get the symbols of companies they love tattooed on their skin! 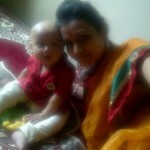 You need tremendous love towards the company to get this done. These tattoos don’t have any significance. They generally reveal the tattoo maker’s artistic talent at distorting lines and curves to make them look cool. Sometimes tattoo designers include ancient symbols if you wish to get that kind of look. Hearts are a very common kind of tattoo. They are mostly seen inked on girls but sometimes you may spot a man with a really cool heart on his wrist too!